flown on through other forms to newer ears. swept out upon the ash heap of the years. declaiming to a street now far away. a record of the soundtrack of his soul. The music exits left when all’s complete. It’s just the players who are obsolete. 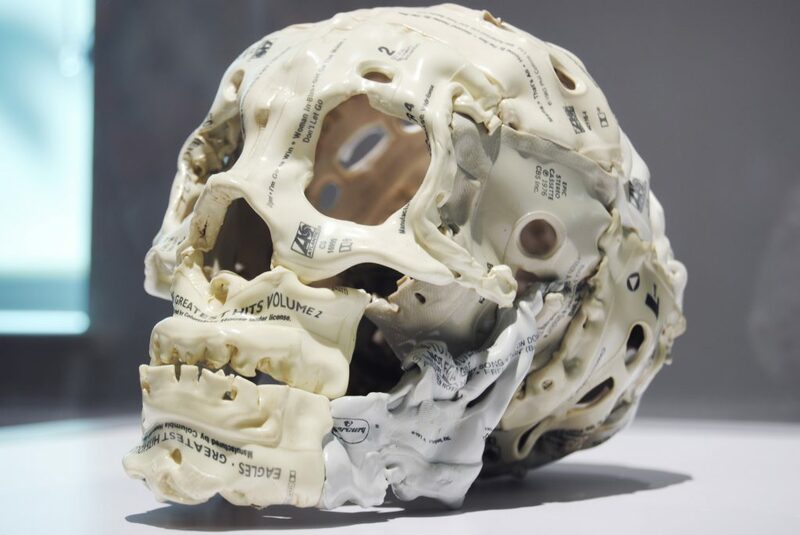 Contest Judge Stephen Gibson says: “This is a knockout of a poem—a hip, colloquial, engaging, rueful, and smart memento mori response in sonnet form to Brian Dettmer’s memento mori, “Skull,”cassettes creation. As Dettmer has us (somewhat) playfully contemplate mortal existence through encountering his obsolescent music-delivery “Skull” construct, with its 8-track titles and manufacturers’ facts and notes, so the author of this poem has us all become Hamlets pondering our own “Yorick” musical past selves, where “The music exits left when all’s complete./It’s just the players who are obsolete.” Terrific, simply terrific. Sean Keck is an Assistant Professor of English at Radford University, where he teaches a range of courses in American Literature and Creative Writing. His research explores literary encounters with other media (audio and film), with particular interest in representations of race and the environment. His poetry and fiction appear in Blue Earth Review, Concho River Review, Eclipse, Post Road, The Worcester Review, and others.